International Cryptozoology Museum Needs Your Help! Loren Coleman and the ICM is in need of financial assistance after a long and tedious IRS Audit has caused a dwindling of funds to keep the museum alive. Coleman, in a posting today, lays out his call for help and, after all that he has done for cryptozoology, it seems that even a few dollars can go along way of his goal of $15,000 to keep the museum alive. The museum, which is in Maine, needs the money to stay alive with Coleman setting a goal of having a permanent space sometime in the near future (we suggest the Northwest Loren!). It is a space that features numerous displays, information, and books regarding all things cryptozoological (not just Bigfoot). To find out more about the financial crisis, to make a contribution, and to check out Coleman's work, check out http://www.cryptomundo.com/cryptozoo-news/help-museum/ We urge you to do so. On February 14th, 2009, Oregon is turning 150. Apparently the proper term for the 150th anniversary is a sesquicentennial. As shown in the photo to the left taken by the talented photographer Stuart Tomlinson of The Oregonian, Oregon has decided to debut its sesquicentennial mascot at Portland's Rose Festival Parade Saturday June 7th. Heres a clip below. You can read his story at the Oregon 150 Website. Many may remember the fiasco regarding the patterson-like still of Bigfoot on Mars. We didn't post anything here at BfRLC, because it was old news really. Well this is hot off the University of Arizona's press. This view from the Surface Stereo Imager, (a special camera--BfRLC)on NASA's Phoenix Mars Lander (The latest NASA robot to land on Mars--BfRLC). The image is the first impression -- dubbed Yeti and looking like a wide footprint -- made on the Martian soil by the Robotic Arm scoop on Sol 6, the sixth Martian day of the mission, (May 31, 2008). 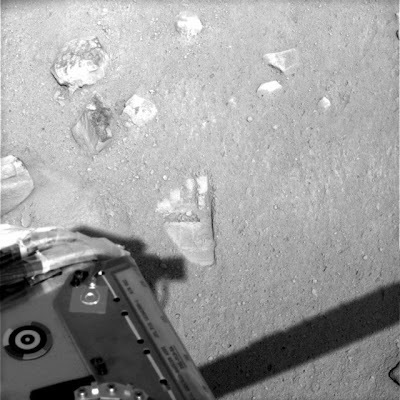 Touching the ground is the first step toward scooping up soil and ice and delivering the samples to the lander's experiments. The impression was named by scientist and engineers. This was the first opportunity to name something captured by the Mars Lander. It wasn't even a natural Martian feature, it was the byproduct of the Lander itself! And what is prescient to NASA's scientific elite? -- Bigfoot. Not only do these Newtonian law-abiding engineers believe in facts and evidence, they rely on them. They live by facts, are suspicious of theories. So suspicious, no theory is even pondered without the merit of reproducible evidence and consistent results. Better yet, if a theory is worth pondering, it may not be worth considering. To be considered it must be published and to be published it must pass the scrutiny of an academic cabal of university professors, gatekeepers to the distribution of new ideas. If you think the Bill from the School House Rocks cartoon had it tough becoming a law, the last time a published theory that became a Law was in 1687. The calculations made and projected by these people does not merely determine the livelihood of their families and pets. Lively hood is one thing but some even trust their very lives to NASA's engineers. Yes, Astronauts, national heroes (US and worldwide)repeatedly relinquish life and fate while they rocket to worlds beyond the bosom of Earth's safe orbit. A feat in itself, but only half the job; astronauts also then are delivered back home safely. Who than, I ask, is better to determine the relevance of Bigfoot. Who better to determine the merits of elevating Bigfoot to the public consciousness; to provide a topic choice for sewing circles and water cooler conversations everywhere. Who then to replace whales on bumper stickers pursuading us to brake for Bigfoot instead? And who better to acknowledge Bigfoot as an Endangered Species to be protected by federal and international laws. Who then? NASA engineers that's who. BfRLC Salutes you. We salute NASA's Ladies and Gentlemen of science and knowledge, for continuing the national dialog regarding Bigfoot; for reminding everybody everywhere how truly relevant Bigfoot is to our communities, homes and minds. I have been kicking around an idea I had lately, only to find I have been beaten to it. Once in a while when the topic of Bf evidence comes up, I'll hear someone say, "next time someone sees Bigfoot they should try and shoot it, and then there would be evidence!" My concern is the amount of times I hear this, so I looked into how to protect a species under the Endangered Species Act. During my research I have found that the government has already done so, at least on the local level. So Skamania County has a real ordinance! I would like to see if BfR$LC can't get this done on the federal level and perhaps protect the big guy from harm.